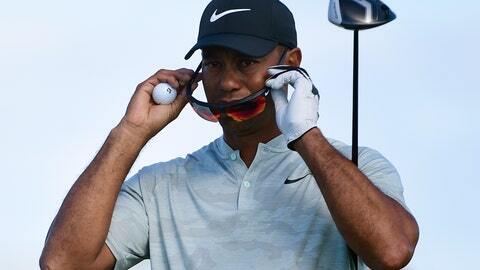 NASSAU, Bahamas (AP) — Upon further review, Tiger Woods hit the ball more than once trying to escape from a palm bush. And under an 18-month-old decision in the Rules of Golf, he avoided a penalty Friday in the Hero World Challenge because PGA Tour officials — and Woods — could only see the violation through a high-definition replay in slow motion. Woods hit his tee shot right of the 18th fairway at Albany Golf Club barely into a palm bush. He took a stance with his right knee on the ground and his left leg extended to get an 8-iron around the ball, barely took the club back and punched — in real-time it looked more like a scoop — back to the light rough.